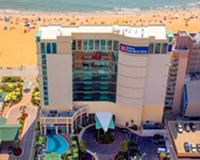 The Hilton Oceanfront (31st Street), the Sheraton Oceanfront (36th Street), and the Holiday Inn North Beach (39th Street) will anchor our events, together with the Courtyard Marriott North (37th Street), the Hilton Garden Inn (33rd Street), and the newly reopened Cavalier Hotel (42nd Street) as additional options for overnight accommodations. With a variety of choices, this North End Collection (see map pdf) of boardwalk hotels offers something for everyone. Some hotels are focused especially on families, such as the Holiday Inn North Beach and the Courtyard Marriott North. Other properties offer a more sophisticated flair, such as the historic Cavalier Hotel, the Hilton Oceanfront, the Hilton Garden Inn, and the Sheraton Oceanfront. Visit the website for the hotel of your choice to register online. Links to registration pages with group rates to come.